Discussion in 'iPhone and iPad Games' started by killercow, Sep 10, 2015. Please note: This app requires iPad 3 or better or iPad Mini 2 or better. Older devices are not supported. A Lovely Trash Adventure! 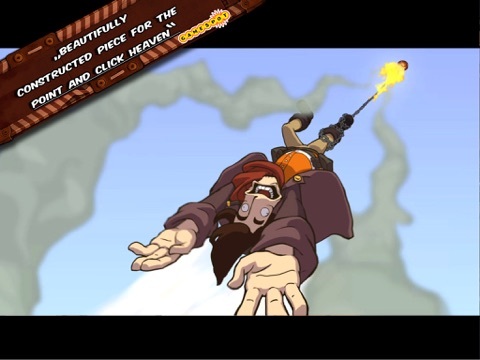 Everything on Deponia is made of junk. No surprise that Rufus has enough of this place and wants to leave all that trash behind. During a risky, reckless and not particularly clever attempt to escape, a mysterious beauty lands right in front of his feet. This isn't the happy end of a wonderful love story but the beginning of a hilarious adventure packed with danger, intrigue and utter chaos. 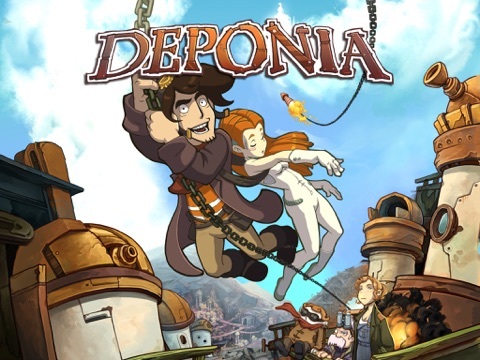 Key Features: •	A cornerstone of the adventure genre •	Likeable heroes and despicable villains - just as a story like this demands •	Hand-drawn backgrounds and highly detailed animation •	A rebellious soundtrack that you won't get out of your head Reviews: Kotaku „Deponia is sharp, pretty and quirky-as-hell, just the way I like my point-and-clickers.” Gamespot – 8/10 "Deponia's tale of love, loss, and all-out comedy is a beautifully constructed piece of point-and-click heaven." Gamereactor – 90% "Likeable characters, an exciting story, a great presentation, amazing soundtrack, logical puzzles and beautifully integrated, intelligent mini games." Gamestar – 88% "LucasArts found a worthy successor in Daedalic." 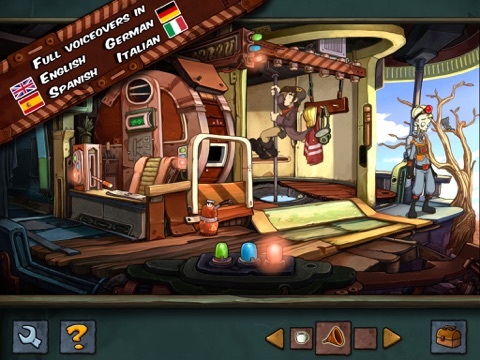 Computer Bild Spiele "Deponia marks Daedalic as a first-class adventure studio. Their humor has pin-point accuracy and the characters are very well-written." Spieletipps – 91 % "A technically brilliant and hilarious Junkyard-Odyssey joining the Major League of LucasArts' legendary adventures." One of the best adventures ever made. Worth every penny. This is all I need this week. What a tremendous shame this is not available for the iPhone as well. Given all the brilliant point-n-tap adventures ported to or made specifically for the smaller screen, the genre's viability on any tapped screen size (possibly excepting the Watch, but not necessarily ) has been well proven. It's a very cluttered game as is (possibly intentionally). I don't think it could fit on an iPhone. Working perfect in iPhone 6!!!! How'd you pull that off? This looks right up your alley @AppUnwrapper! I love that more and more of these big indie games are coming our way, particularly point and click... they make so much sense on iOS. I do fancy this but the reviews of the PC version are decidedly mixed, with the latter 2 games getting slated in some places. I can't speak for the sequels, but I'm enjoying the hell out of this one. 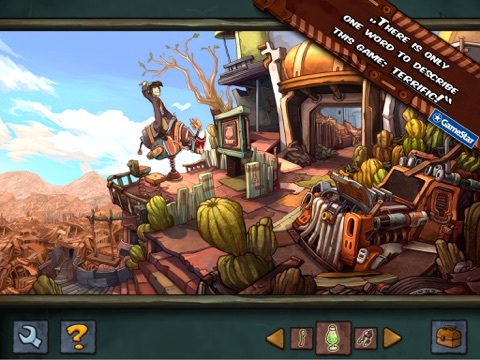 Has the polish of a LucasArts game, and a pretty slick interface once you understand it. So far no crashes, bugs or corrupted saves. Bugger I was hoping someone would say it was bobbins then I would have an excuse not to buy!! Ahh well another one is about to be added to the backlog then. On the PC, it is about on a par with most traditional point-n-click in terms of clutter-y-ness. 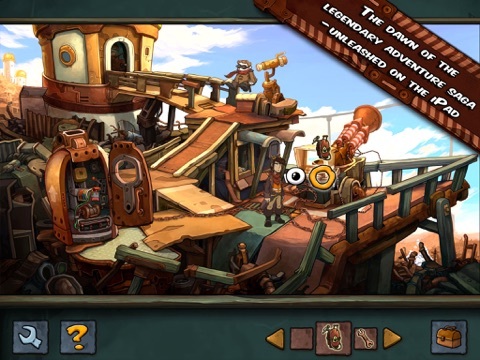 In as far as the Monkey Island remakes, Beneath a Steel Sky, Broken Sword, the Hector series, the Blackwell games, Longest Journey, etc, can be considered viable fits for the iPhone screen (which is, of course, subjective), Deponia could be ported with similar results. I can't recommend this enough if you like point and adventure games ! Played this on the pc amonth ago and it is amazing nice voice acting good length great story, the puzzles are well done sure some will get give you trouble but that's the point and there's always a walkthrough. Yep, this guy clearly didn't like it. I'm still enjoying it, although I didn't spend his full 5 hours in the first location. Id probably hate it too if I was stuck for that long in one place. And it wasn't the 5 hours in the first area that turned me off. I was just pointing out that it felt like a real messy room. It was all the other things I mentioned that bothered me. My sincere apologies for making assumptions about your gender, and for carelessly misreading/misrepresenting your review. To each his/her own, as they say. I didn't mean that P&C's can't/shouldn't be ported to iPhone. I played Broken Sword, Broken Age, etc on my iPhone and they fit fine. Also, I was surprised Dead Synchronicity wasn't ported to iPhone as well, because it felt like it could have easily fit comfortably. But with Deponia, I found things to be a bit small even on my iPad, so the thought of shrinking it all even more sounded awful.